Hi there. My name is Greg Panciera. I’m a music professional based in Chicago, IL. I make my living helping people organize and capture their musical ideas. I also occasionally perform with a few different bands here in town. Like most musicians, I’ve loved music for as long as I can remember and I’m a firm believer that the process of creating and capturing music should be both honest and inspiring. Every artist is unique and requires a different approach in the studio; I have experience working with artists on a range of levels and have been fortunate enough to work with, as well as learn from, some truly amazing individuals over the years. If you’re a younger artist about to embark on your first studio project, or if you’re an experienced veteran, as long as you’re interested in making honest music, it would be my honor to assist you in whatever capacity that I can. If you’re not sure exactly what you need or whether I’m the right person, please don’t hesitate to give me a call; I’d love to hear about your project, and you can rest assured that if I don’t feel I’m the person you should be talking to, I’ll always say so. 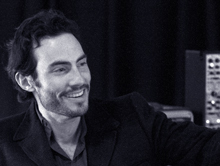 Greg Panciera is a producer, mixer, and recording engineer, based in Chicago, IL. Greg has worked with artists including Half Moon Run, Mutemath, The Wombats, Alessandro Cortini of Nine Inch Nails, and The Blasters. He has worked as an assistant to some of the best producers in the business including Sylvia Massy (Tool, System of a Down), Dave Bianco (Bob Dylan, Tom Petty) and Dusty Wakeman (Lucinda Williams, Dwight Yoakam). In addition to work in the studio, Greg performs on bass with Grammy-nominated Chicago artist Cathy Richardson, and on guitar and keyboards with The Noise FM. He also teaches recording and production classes at Tribeca Flashpoint Academy and SAE Institute in Chicago. Prior to moving to Chicago, Greg worked as the Director of the Independent Artist Program at Musicians Institute in Hollywood CA, where he taught production and recording classes and built a curriculum to teach independent musicians how to record and promote themselves.